Exhibited (presumably), Royal Academy, 1777, number 94, “A view near Tivoli”, sent for exhibition from Rome. Solomon Delane (Delany; Delaney) was born in County Tipperary, the son of a Clergyman, Richard and his wife Sarah. He was brought up at Upper Coombe, Dublin, and received his training in the Dublin Schools under West, where he also attended the Dublin Society’s School of Landscape and Ornament under James Mannin. He won a prize at the Dublin Society in 1750, when he was placed second in the order of merit. About this time his father (1750) and brother Richard (1752) both died, leaving Delane with a comfortable income from a family portfolio of property in Dublin and elsewhere. Soon after he travelled on his first Grand Tour to Italy where he arrived in Rome in 1755. 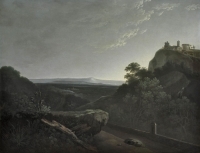 Much of the next 15 years were spent by the artist in and around Rome, where he developed a distinctive and highly sophisticated landscape style which initially owes more to the refinements of the 17th century, and its debt to Claude Lorraine, than it does to the Romantic Topography of his own age. In 1763 he was elected a member of the Society of Artists in London, and in 1766 was sending landscapes for exhibition at the Dublin Society of Artists. In July 1777 he was elected member of the Accademia di Disegno in Florence, and 1779 he went on a painting tour to Germany with the hon. Aubrey and Lady Catherine Beauclerk. Delane is noted by many correspondents on the Grand Tour during the years to 1780, and he sold pictures to some of the most distinguished of them, including Nathaniel Dance’s client Lord Charles Hope, the Earl of Upper Ossory and Hugh Percy Lord Warkworth. In 1780 he was back in London where he exhibited pictures at the Royal Academy 1782-4; his work was held in high esteem as his pictures “ bore a strong similarity to his favourite model Claude Lorraine”. Delane died in 1812 in Dublin, where he had lived for the last two decades of his life. The present painting shows the cool silvery tonality which is the hallmark of the painter’s style. 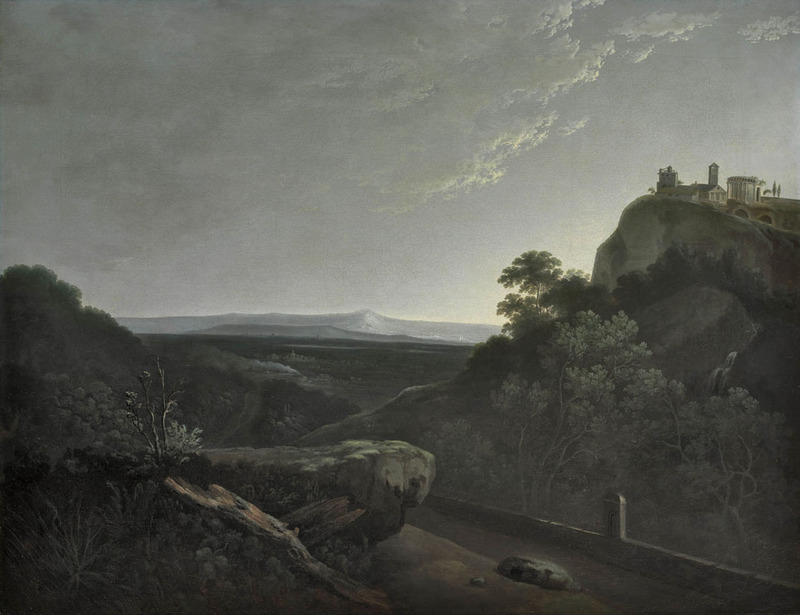 The painting of night scenes was popular amongst the immigre artistic community at Rome: Jacob More painted several (including the vast Flood recently acquired by the Tate gallery), Joseph Wright, who painted numerous night scenes, and the Frenchman Volaire, who painted volcanoes by night. In these pictures, much approved by Goethe, and dating from the 1770's and 1780's, we may trace the onset and development of the Romantic movement. Delane had already visited the subject matter of Tivoli earlier in his stay in Rome, and had executed a set of four large canvases for Lord Charles Hope in 1763 (now in the collection of a collateral descendant in Scotland), just before Delane's brief return to London in that year. We know that he was painting the subject again in the late 1770's, when, in September of 1779, he was visited in his studio by George, Lord Herbert (1758-1827), who was on the look-out for paintings for Wilton House. Here he saw a “Moonlight Scene” (perhaps the present painting) amongst other pictures, though he seems not to have been enamoured of them. Perhaps, like another visitor to the studio, James Irvine, a year or so later in February 1781, he found the colouring “was a little too cold”. Curiously, it is this idiosyncratic restrained and cool tonality which is so attractive to modern viewers.